To succeed today, your organization must generate amazing results. Sounds simple. But in a world where people with opposing views on nearly every topic imaginable must come together and reach even better conclusions, it’s not as easy as it sounds. Your employees and teams may be quite capable of handling their specific areas of focus, but unless they work together seamlessly, products, services, and profits will suffer. Combining her longstanding expertise in collaboration and recent discussions with 20+ Silicon Valley leaders, Dr. Spitzer has created that new approach. 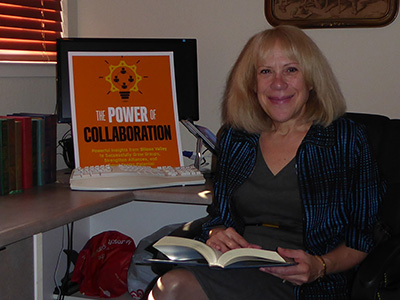 She shares it in her book, The Power of Collaboration (published by Career Press, December 2017). In this book, Thea examines California’s Silicon Valley and how many of the companies there have succeeded in building complex, successful businesses. These companies and leaders have succeeded because they didn’t just apply existing business models—they created a new one; one that fosters employee collaboration at an entirely different level. Narratives about collaboration from top leaders in Silicon Valley. A sensible, straightforward collaboration framework. Positive, realistic hints for adapting that framework to your organization. With The Power of Collaboration as your guide, amazing results are possible. The book offers an individualized journey with applications for you to try-out as your read (customizable to your current job/role). The final chapter provides an employee survey to assess the current state of collaboration at your firm and folds your thinking and activities into an action plan to help you and your organization. Thea Singer Spitzer, founder of Critical Change LLC, has been a consultant, strategic advisor, and coach to executives, leaders, and organizations for nearly 30 years (including 16 years with Microsoft). Over her management consulting career, Thea has built a number of specialties. Her expertise in collaboration is a union of company need and her own passion. She has helped companies achieve so much more by fostering a culture where employees work better together. She helps clients do things in ways that make the most sense for today and tomorrow. Learn more about Thea Singer Spitzer.